What is the best Hilton Honors redemption? In my article yesterday, I outlined ‘the facts’ of the Hilton Honors loyalty scheme. This post is my personal opinion, highlighting areas where I think you might want to focus. Let’s hit the good points first. Hilton Honors offers the best mid tier status of any of the hotel schemes. Once you have a Hilton Honors Gold card, you will receive free continental breakfast and a ‘preferred room’ of some sort at most – not all – of the Hilton brands. You can status match your existing mid-tier hotel card and get upgraded for 90 days, with an extension if you hit a stay target. Hilton Gold is also free if you hold an Amex Platinum charge card. I am impressed with the way that the portfolio has been refreshed in recent years. We have seen impressive new upscale Conrad and Waldorf Astoria hotels and decent Hampton budget properties. I would rank Hampton above Holiday Inn Express and indeed most Holiday Inn properties. The core Hilton brand is also seeing a resurgence with impressive new openings such as Tallinn and Paris Opera which we have reviewed. The Curio brand, which is attracting leading independent hotels to sign with Hilton, is also looking promising – here is our review of Gran Hotel Montesol, the boutique luxury Ibiza hotel and here is our review of the Boston property. There are still some identity issues in the portfolio. I defy anyone to explain the difference between a Conrad and a Waldorf Astoria. Why is the very nice Venice hotel branded as Hilton? Why is there no real distinction in the UK between Hilton and DoubleTree? Indeed, why are UK DoubleTree properties superior to Hilton when the opposite is meant to apply? There are also variations in how status members are treated. Due to the huge number of people holding Gold status in the US via credit card offers and the like, you won’t get much from a property there. On the other hand, a Gold travelling in Asia can often do very well for upgrades and benefits. I was happy to move across a slug of Amex Membership Rewards points at 1:2 when a suitable redemption opportunity came up in Tokyo last year. I got almost 0.5p per point which meant almost 1p per Amex point, which is very good. The Hilton Auctions ‘redeem points for experiences’ scheme continues to improve. It isn’t yet on a par with SPG Moments but it might still get there. If you’ve got Hilton Gold and you avoid staying at the most dated UK Hilton properties, you will probably have a decent stay. Interestingly, top-tier Hilton Diamond status is generally seen as having only modest value. Unless you stay at hotels with a lounge, where you are guaranteed access, you get little extra at most places than a Gold. A better strategy may be to secure your Hilton Gold requalification and then focus on achieving mid-tier status with another chain. How did the 2017 redemption changes impact Hilton Honors? In the short term, everything is OK. But the 2018 changes are coming …. Full details can be found on hilton.com on this page. There is a trend in the airline miles sector to give more rewards to big spenders and reduce benefits for the rest. We saw this with the last set of Avios changes in 2015, where discounted economy tickets went from earning 1 x miles flown to just 0.25 x miles flown. Hilton is moving the same way. What I don’t quite understand is where this fits in with Hilton’s big ‘book direct’ campaign. For a Silver or base member, who gets no real status benefits and who is now seeing his or her points cut and their ability to earn miles removed, why should they book direct? If the price is the same then Hotels.com Rewards – which effectively offers you 10% of your spend back in free nights as I explained here – looks attractive now. At the same time, Hilton has clearly decided that it wasn’t doing enough to keep members loyal once they had their Gold or Diamond requalification in the bag. There are now three reasons to keep going: extra bonuses for doing 40+ nights, elite rollover nights and the ability to give status to a friend. The other UK-specific change recently is the removal of the Visa credit card to new applicants. This was my favourite ‘starter card’ for newcomers to miles and points and it was a shame to see it go. Hopefully we will see a new product at some point in the next year. Decent new hotel openings and the ease with which you can now obtain Hilton Gold (via a status match or from Amex Platinum) means that I am more positive about the company than I was two years. The 2017 changes were, in general, an improvement and so far the company has not – in the main – been quietly increasing the points caps on each hotel. The 2018 changes coming soon are disappointing but will have little impact on the status members who make up a large part of our readership although the loss of occasional lucrative mileage promotions will be a shame. Hilton matched my IHG platinum status to Diamond for 90 days, with the extension requiring 8+ stays (or 4-7 stays would award gold). Hilton Honors Gold status is more valuable than IHG Spire status mainly due to the free breakfast offered by Hilton. For a top tier status, IHG Spire is extremely poor value. Andrew, I think as with all chains it depends on the Hotel you are at and how you interact with them. I’ve done spectacularly well with my £99 IHG Platinum status. Most recently being the Holiday Inn Krakow, which is a proper 5 star hotel by the way. I had booked a junior suite and asked via email if the Presidential Suite was available and if they wanted to give me a complimentary upgrade that would be nice. We had 4 nights in the £679 a night Presidential Suite as an upgrade. (Free mini bar filed daily included. Snacks, beers and wines complimentary, just miniatures were not. Fantastic hotel and city. Hilton still my preferred program too, though all the hotel chains are busy trashing their loyalty programs in the face of a thriving economy and high occupancy. Hilton’s once-attractive “cash plus points” bargains are all gone, and they’ve done a “Delta” on award-pricing – concealing the price-list so Hilton award nights now cost whatever price Hilton feels like charging on the day. And no, the promised price caps are now history, check Loyalty Lobby for this month’s list of Hilton’s unannounced award-rate increases, it’s “only” 221 hotels long. Meanwhile Hyatt has also shot itself in the foot with its new program, IHG has gutted the one great “wow” factor of Priority Club – Pointsbreaks – and as for Accor’s program, well that never really had a wow factor. Spot on – couldn’t have said it any better myself! I used the Whyndym Rewards status match, and now have Diamond but I haven’t used it yet. Would you be able to share your experience with status recognition at their hotels? Also do they have any aspirational properties to stay at because that is what motivates me to earn IHG points and status? I lack any interest or motivation if my free night will be at a hotel which I can afford anyway. Thanks! I have found it very good. I matched my accor platinum last year, having had a love hate relationship with accor for many years. Always get an upgrade of some sort, and proactive offering of lounge access and breakfast. And if and when things go awry they are very good at sorting it out. I have to say I’m.impressed and I didn’t think I would be. Maybe I’ll be tempted to try a best western out if the recognition is good. Out of interest were you matched to diamond or higher? Hilton in general is a much better hotel group than IHG in every area. It’s just a shame that in the UK there are three times as many IHG properties than Hilton. It’s such a big plus to receive free breakfast with my Gold tier status. It is one of the reasons why I always choose Hilton, where possible, over IHG, whom don’t offer free breakfast with any status. IHG need to wake up and smell the coffee! IHG hotels do often give me free drinks vouchers as a Platinum, but I dont always want a drink. Breakfast is much better and a similar cost in a HI. I have the Hilton Barcalycard VISA and have earned the wknd night. Is there any reason to keep it? Thinking it makes sense to get rid to clean up some available credit on credit file, and be ready as/when a new card is launched. On the other hand, it’s a reasonable earner for non-Amex spend if Hilton points are my target. I’m about to earn my free night and intending to keep the card (as long as it lasts) as the earning rate is about as good as it gets for non-Amex. My wife will cancel hers once the free night is earned to be ready for a new card if and when. I’m in the same boat but am keeping it at present to earn HH points once i’ve triggered my next Lloyds upgrade voucher (I only use the Lloyds MasterCard so avios earning is minimal on that). If another HH card comes out and there’s no kind of “upgrade” bonus for current HH visa holders, I’ll look at getting the OH to apply for it if it’s worth it. I have never churned M/Cards or Visa (though I did take out a Virgin Amex/Visa combo for a couple of months in order to get up to 10 000 FC points, so that I could convert them to Hilton). I can see no good reason for ditching the Hilton Visa before you have to – the 2 or 3 points per £1 is surely as good as it gets at present! When Barclaycard lost the IHG contract, the new Creation IHG M/Card came out before the IHG Barclaycard died completely, so for a few months I had both. Rob implied yesterday that any new Hilton card would be an M/Card, and not a Barclaycard, so I would hope that there will be another starter bonus when it happens. Agree that 0.66p of value per £1 via the Hilton Visa is about as good as a free card gets. If you send £10k a year on the Barclaycard Hilton Visa it keeps you Gold tier for the following year which = free breakfast……yes IHG, I did say, free breakfast. What I didn’t say is a worthless 300 to 500 points with a token free drink from the bottom shelf at the bar! I had forgotten that £10 000 => Hilton Gold – not that I am likely to spend that much anyway. Do you know how they define ‘year’? Is it calendar year, or the ‘year’ for which they send out the Annual Summary – in my case August to August? Saying bottom shelf is unfair. You get any bottled beer, draft beer or wine as a platinum, and add spirit and mixer to that list as a spire. It’s a nice gesture, and remember that what IHG lacks in status benefits, they more than make up for with high points earning via accelerate at cheap properties for redemption at high end properties. If you don’t like IHG then don’t use them and credit stays elsewhere if their programs work better for you! Good points earning… although IHG redemptions are worse value because you don’t get free breakfast or lounge access. Of course there’s also the 4 x 2500 points to earn for first 4 Hilton bookings with the card. I use the Hilton card for the points in situations Amex is not accepted and decided to keep hold till I see where the replacement is going. The downside with keeping it is if the new supplier has a free night voucher but only for new customers who don’t have the original Barclaycard version. It will surely be new customers of the bank. Why would the bank sign a deal that disincentivises the majority of the new customers they wish to attract. Fingers crssed. Hilton is my goto brand – the breakfast benefits and room upgrades from HHG via Amex has comfortably exceeded the Plat fee over the last year – add in PP and although it might be heresy to admit on HfP but the Amex Plat is the one card I wouldn’t churn. But you retain the gold status for at least a year even if you do churn. I’ve just upgraded to Amex plat and I’m struggling to justify keeping beyond.the first month. But you lose PP straight away – for mine and OH’s travel profile this is very useful. There is the ability to get 18000 MR points for referrals – if you value MR points at say 1p and refer 2 CCs per year I think you are virtually there…. But if you take it in turns to churn gold with your partner you can still make referrals without ever incurring an annual fee. Plus, you can upgrade to plat (20k), refer as plat then cancel. Earning Avios on Hilton purchases through Avios website. As we all know, claiming the Avios is a slow and very painful process. I have had to chase 7 claims in the past year; 2 were succesfully confirmed and Avios were credited to my Avios account. So I login this week to see that they have since been removed from the Avios account! I asked on twitter and they said my purchase probably violated thier T&C’s – I don’t see how, stay was completed long ago as well, wayyy past the 120 days they mention. I have been directed to email their customer account team, I imagine it won’t be easy to get back. I don’t understand though – if they went through the manual steps to confirm and give me them in the first place, I imagine they would have checked that it was all legit! My Avios.com balance is now annoyingly MINUS several thousand as a result of Hilton taking back points they had previously approved months and months ago. I really don’t know what to do about this situation other than simply avoid using Avios.com anymore – which is annoying especially when it comes to using it as a middle ground for Iberia Combine My Avios. FlyingChris, did you write in to the Avios team, if yes, any response / support? Or dead end? I have written, awaiting their response. All these programs misdirect their benefits towards business travel rather than leisure travel. It’s a point that’s been made many times before. When I’m traveling on business I don’t need upgrading to a suite, free breakfast (I’m not paying) or access to the executive lounge. What I would like is to be able to book a family room and have free breakfast for my wife and kids once or twice a year. Sorry for the duplicate post above btw. As a moot point, how would a hotel brand administer that? Perhaps foregoing breakfast and asking for a credit on your personal account for future use? Wouldn’t that be using company money for personal use? I could see something like, buy x number of full breakfasts between the month’s a—b and get one free for a registered guest. Doesn’t have to be that complicated. Free breakfast could be extended to on adult guest for, say, gold card card holders. I don’t expect a credit for the fact that breakfast is always included in my corporate rate, just pointing out that it’s a perk that does not actually benefit me or my company. Young kids should alway get free breakfast regardless of status. Why should I pay £15 for a bowl of cheerios? And why does a family room often require more points than two standard rooms? At least SPG gives a discount on the second room. I didn’t realise SPG offered a discount for 2nd room… is that for points bookings and for cash bookings? Hilton also used to offer a 50% discount for a 2nd room for kids but it was always kept very quiet and may no longer exist. It was never bookable online. SPG does offer the family deal online when you try to book 2 rooms, we used it at Dusseldorf Airport last year. I would have used points but the saving on the 2nd room made it a bad deal. I have a small stash of points in multiple schemes (Marriott, IHG and Hilton) and have struggled with this. In fact, I’m just about to attempt to find a family room redemption and free breakfast in San Francisco. Suspect I won’t. But Marriott offers you this. A Gold gets free breakfast and many hotels offer generous cash upgrades via the website for award rooms. We have just booked a ‘sleeps 4’ junior suite in Venice for a €200 top-up payment over a standard reward room, for example, for August dates when cash junior suites are €600-700. Do you have, or would there be any interest in crowdsourcing, a list of Marriott properties that allow 4 people in a standard room? Did the €200 top-up come as a standard option when searching or did you need to call the hotel directly? It comes up as a standard option when searching although the €200 number moves around – last year it was €300, the year before €100 IIRC. No correlation to cash rates – last year for the same week cash rates were lower and the €300 co-pay made no sense. I think we paid €500 cash instead for a room with breakfast and I saved the points. However, at 45,000 points plus €200 vs €650 cash I will happily pay for four breakfasts …. 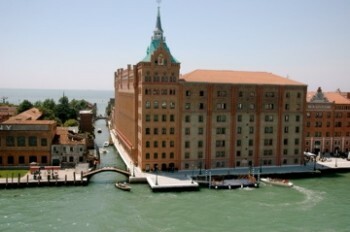 Venice actually offers virtually all of their suites as a co-pay reward option. Flyertalk may have something similar to what you’re after, I don’t know. It’s not really the sort of thing I want to administer. Thanks Rob – I forgot about the cash upgrade part which, as you say, can be quite generous. I am now looking at the Marriott SF Union Sqaure – nice and central and five nights for the ‘price’ of four. The biggest problem with Hilton is the gifting of Gold and Diamond to so many people. As a result those who stay a lot are often denied upgrades by those who stay very little and have the same status level. This is particularly bad in the USA where status has little benefit. I think this is the case as well . I do wonder if when you are checking in and the reception staff can see that you are ‘gold’ or ‘platinum’ etc , can they tell that you have earned that status from stays , or by taking out the right credit card etc ? Are there any non-business users here? As a very light user of the big hotel brands I struggle to see a benefit for me personally. My usual route is via Virtuoso agents, SLH, OBA or Villa/apartment rentals to get what I need depending on location and what standard I want. Well probably, but SLH and even some Virtuoso can work out more affordable after the benefits and offers. An example we were in Miami last year stayed in an SLH hotel, very nice with an offer 5 for 7 nights free breakfast and a couple of SLH member benefits, worked out at around £200/night I think. Not too bad on SoBe in peak Nov/Dec season. But the flipside is an apartment rental in Portugal for £100/night on EasyJet. I like both equally. If I can route my spend through hotels and gain benefits then great but I route all of my loyalty stuff into BA, all of it. This might not be the most cost affected route as it may be better paying for flights and putting MR into a hotel scheme. I haven’t done the math and I suppose the answer is that everyone has their own needs and preference. These articles are very usueful and I should work it out for me and MBH, I feel a spreadsheet coming on. I’ve just got an email from Hilton Honors from my status match request allowing me to keep my original Diamond status match from 2016, till March 2019 subject to the 8 stay challenge, which for me is fantastic as we have stays in a few weeks in the Conrad Bangkok and Hilton Bali and I was worried Gold would not get me room upgrades or get us into into the lounges. Darren, all of our trips are leisure and although it was easier to get Diamond the first time around the benefits we have experienced were well worth it. Amex MR points have paid the lion’s share always booking standard room, which was all you used to be able to book on points, and have been royally upgraded to suites on all of our stays, except the Conrad St James which was on the now defunct Hilton Honors Barclaycard voucher but still got their one below suite. I will looking at mattress runs up till June because of the travelling and Hiltons we use, to keep it, having lost Diamond by not quite enough stays to automatically carry it over. Between my Hilton Diamond and IHG Platinum (£99 well spent) and my GHA Black (another £28 well spent to get Platinum with a free upgrade to black after a stay in the Pan Pacific – best hotel I’ve stayed at in Singapore) we have travelled in style, purely for leisure, and received thousands of pounds of benefits. That’s interesting Olly thanks, I can see similarities with our travel locations. I’m a non-biz user, been collecting HH points for approx 13 years and only stayed in Hilton for work twice in that time. Once got some status benefits …..comp bottled water, but nothing else and because it was crown rate they wouldn’t credit points to my account. I really like the Hilton brand and find HH a good programme to be in. Doubletrees I really like as I only look for a clean, comfy, decent room with friendly service to sleep in as out and about exploring in the day. High end hotels are lovely but I don’t need them so paying such a premium would be a waste unless I decide to stay all day and use all tge facilities. Completely non-business travel these days. In business days I seldom paid anything, since most of my business travel was arranged for me by Tourist Boards. If I was asked to pay anything it would be a token £50 for return flight on LH and three to six nights accommodation. These bookings were always on special rates that earned no points. These days it is almost always 2 retired adults looking for value for money / points. Room rates > £90 or 20 000 points (Hilton / IHG / Radisson) tend to = ‘try somewhere else’. We would much rather get three nights in three Holiday Inns or cheaper Hiltons, say, for 45 000 or £150 than one ‘upscale’ hotel night.. I could say more, but I have just noticed that Tilly has just said it for me! Thanks! When I originally did itt in 2016 I first did a status match request with Best Western who bettered my Gold with Accor to their Diamond, stayed a night at the cheapest BW and sent a screenshot (jpeg not png) of my status and stay with BW via the dedicated Hilton status match webpage. I wouldn’t bother with the online chat as it’s more for reservations. It took about a week as I recall and my Hilton silver from the Hilton credit card was upgraded to Diamond for 18 months. No challenge required. It depends if BW are still being that generous, check StatusMatch. Agreed Genghis, if you already have Diamond with Hilton, which is what happened to me but I have seen on Status Match recently that newbies are getting straight matches to Diamond albeit only for 12 months this time around. Hilton turned down my status match request. It took me two attempts to get my challenge request a response. Try again and make sure your screenshots are Jpegs and it is via the Hilton status match webpage.